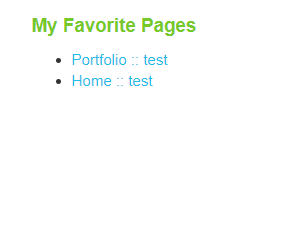 This addon allows visitors to keep his/her favorite pages so that he/she can re-view these pages in an easy way. A visitor push the "add to favorite" button. The visitor's browser stores the information into its local storage. "Favorite list" block will read the information from the local storage and display it. 1. This addon uses local storage, which needs modern browsers. 2. Users who disallow local storage usage will not store favorite pages. Also, when he/she clears the storage data, the favorite pages record will be cleared.